Halloween was once a one-day event for trick-or-treating through neighborhoods. Now it’s a season; one filled with costume parades, pumpkin patch visits, and parties galore. The happiest Halloween party of all? Mickey’s Halloween Party at Disneyland, of course! Each fall Disneyland gets all dressed up for Halloween with spooky decor, pumpkin-themed treats and special rides and shows. Read on to learn how to join the fun and save money on Mickey’s Halloween Party tickets. My family has visited Disneyland at Halloween before but we’ve never stayed up late enough to party down with Mickey and friends at the separately ticketed party. (The party starts at 7 pm,which is when we are typically donning our jammies at our house!) This year my kids are ages 5 and 8, which I think is old enough to take the late night plunge into the spooktacular fun. We’ve got our Mickey’s Halloween Party tickets for opening night on September 27. We’ll be decked out in our scary costumes: a devil, a vampire, a spooky ninja and I am going as…Minnie Mouse. Well, Minnie may not be scary, but she sure is fun. And to me, family fun is the whole point of Halloween! This is a real treat because usually Disney park-going adults are not allowed to come dressed in costume…particularly a Disney character costume. Join my family and other party-goers at Mickey’s Halloween Party by following the Twitter and Instagram hashtag #HalloweenTime this season. 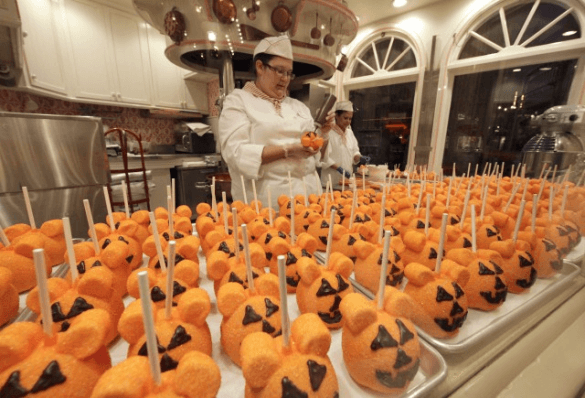 Who’s going to get one of these jack-o-lantern candy apples? This Travel Mama, that’s who! 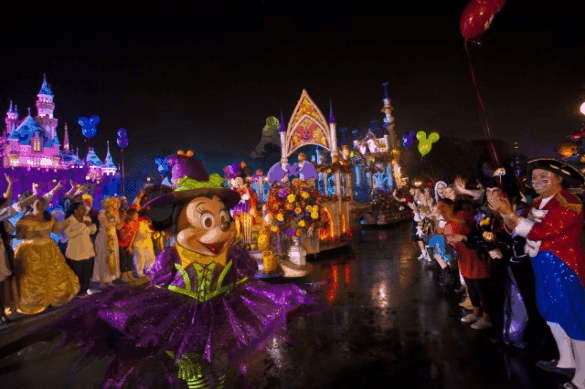 Save money and join the fun – get your Mickey’s Halloween Party tickets today! 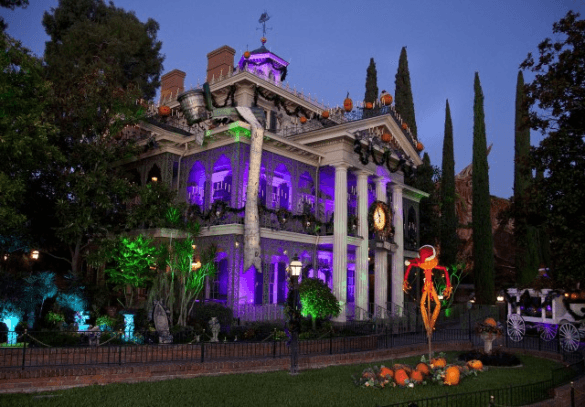 What do you have to do save money on Mickey’s Halloween Party tickets? Buy tickets in advance…that’s it! Tickets purchased in advance for this separately ticketed event are $59 each, whereas tickets purchased on event days are $67 each. (All tickets to Mickey’s Halloween Party on Wednesday, October 30, and Halloween Night, Thursday, October 31, are $74 each.) Purchase your Mickey’s Halloween Party tickets now! Check back next week to see photos of my family dressed up in our “scary” costumes and to get my take on all things Mickey’s Halloween Party! 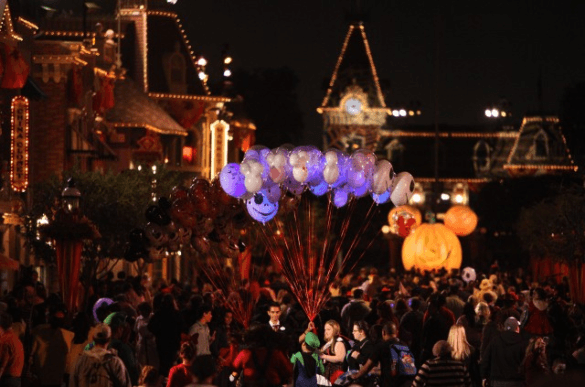 Have you ever attended Mickey’s Halloween Party at Disneyland? What is your favorite part? Do you have any tips to share? Let us know in the comments below! A Note from The Travel Mama: As a member of the media, my family was given Mickey’s Halloween Party tickets. All opinions are mine, as always. Never been to Disneyland but it is a place that I would love to take my boys. Oh my! Raymond, you MUST go to Disneyland with your boys someday! You will all have a ball! It was so fun to see you! Mickey’s Halloween Party is so fun! Kate – So fun to see you IRL! Your family looked so adorable in your Mary Poppins costumes! great tips! and what FUN! wanderingeducators – It was such a fun way to celebrate the start of Halloween season! It looks so fun! Disney really makes the holidays extra special.